We’re excited that you've subscribed to the Mangrove Action Project’s newsletter! I’d like to tell you a bit more about MAP and an exciting new opportunity we have been given. From our office in Thailand, MAP works in SE Asia providing practical, proven methods of education and training so coastal communities can conserve and restore their own mangrove forests. For example, MAP has been collaborating with Ban Nai Nang to generate new income from beekeeping while restoring their mangrove forests. The village is now producing honey from mangrove flowers, and value-added products such as hand soaps, shampoos and balms. 10% of honey product sales goes into a Conservation Fund that gets put back into restoring mangroves that the area has lost in the past. Now, Nai Nang wants to pass that knowledge on to other communities. Just recently, the GlobalGiving Foundation selected us to participate in its Accelerator, a fundraising opportunity for nonprofit organizations around the world. In order to succeed, we must raise $5,000 from 40 donors by October 2nd. If we meet this threshold, we will be permanently featured on GlobalGiving’s website, where we have the potential to benefit from corporate relationships, connect with new donors, and access online fundraising tools. Please help us reach the threshold of $5,000 from 40 donors! 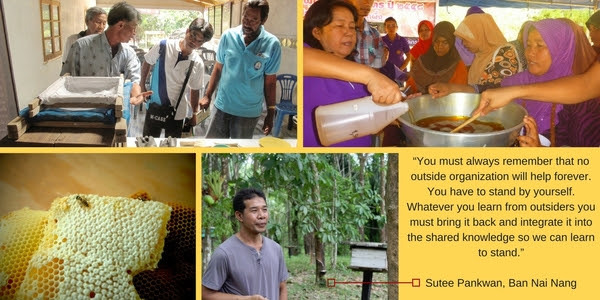 Be one of the first people to make a donation at https://www.globalgiving.org/projects/beekeeping-for-mangrove-conservation! Your donation will provide other villages with materials and training to create bee boxes, and equipment to produce soaps, shampoo, and hair conditioners.